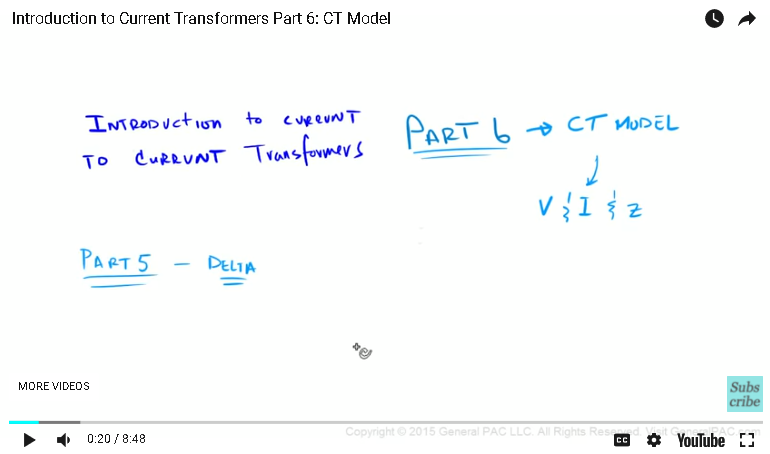 Introduction to current transformers part six. In part five we connected three TCs in delta and showed how the currents would circulate for the delta connection. 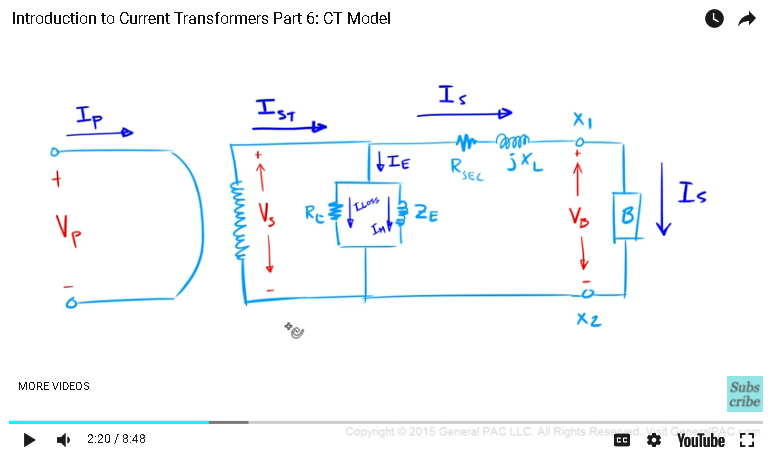 In part six we're going to draw the current transformer model and show the voltages currents and impedance's that are associated with the CT model. Okay, so to begin we're going to draw two [windings 00:00:23]. Here's our primary winding and here is our secondary winding. Okay, so right after the secondary winding we're going to draw what we call a magnetization branch. So, in our magnetization branch we have this resistor here, which we're going to call RC. And then we have this reactons here, which we're going to call ZE, connected like that. And then we're going to have a resistor here, which we're going to call R secondary and then another reactons here, which we're going to call J and then consider this as our CT terminal or the X1 terminal. Similarly, we're going to have an X2 terminal on the secondary side and then the terminals are connected to what we call a [burden 00:01:18], label it as a B. Okay, so let's now annotate our currents. So this current here, we're going to call this I S T, okay? And then, this current right here, we're going to call this current IS, which is the same current that's flowing through our burden, IS, okay? And then, we're going to zoom in and call this current here IE, this current I LOSS and this current IM, okay? And then for our voltages we're going to call this voltage here VS which is measured across a winding. And we're going to call this VB, which is measured across the secondary terminals. And then of course we have the primary voltage which is measured across the primary winding and notice how we have a single turn on the primary side. And then of course we also have the primary current. So this is the simplified CT model that we're going to analyze in part six. Okay, so first of all let's label these currents, okay? IP is obviously the primary current that's flowing through our primary winding. IST is our secondary total current which equals IS plus IE. IE is our excitation current which is a non linear value and is going to changed based off our secondary flux. This is going to be explained later but the excitation current is equal to ILOSS plus IM so let's make this a little bit smaller. Okay, ILOSS is the current required to supply the core losses of the transformer. IM which is this current here, that is our magnetization current which is really a non linear value. And that's the value that's proportional to the secondary flux. And lastly you will have IS. Now remember IS is this current here which is going to our burden and our relays and our meters and anything that's actually connected to the CT terminal, okay? And that's our secondary current. Now, let's move on to our voltages. VP is our primary voltage. VS is our secondary voltage. The secondary voltage is really described as a voltage across this magnetization branch. Which is very important voltage. Okay? And then of course VB is our voltage across the burden. So, our burden, which is also very important. Often times VS and VB are used interchangeably but they should not they are two different voltages. Okay, let's now move on to our impedance's. So, RC is a resistor required to model the losses of the core. ZE is a magnetization impedance. Now this is an impedance that changes with the respect to the secondary flux of the transformer. R secondary is actually the resistance of the coil per turn. So, each turn has a resistance that's associated to it. And R secondary models that resistance. Secondary winding resistance. And this value will change based on the number of turns that you have on the secondary side which is quite obvious. So, JXL is the leakage reactance. And that's the small amount of flux that will not pass through the secondary winding. So, it's the flux that's not actually reaching the core. So, that is modeled by this particular impedance. Okay? And then lastly, our most important impedance is called the B which is the burden. Which is essentially everything, all of the impedance's that are connected from this X1 terminal to the X2 terminal. So, that includes the lead impedance, any sort of relay impedance, if we have series of relays that are all connected together that all of those impedance's are added up and are considered the burden. 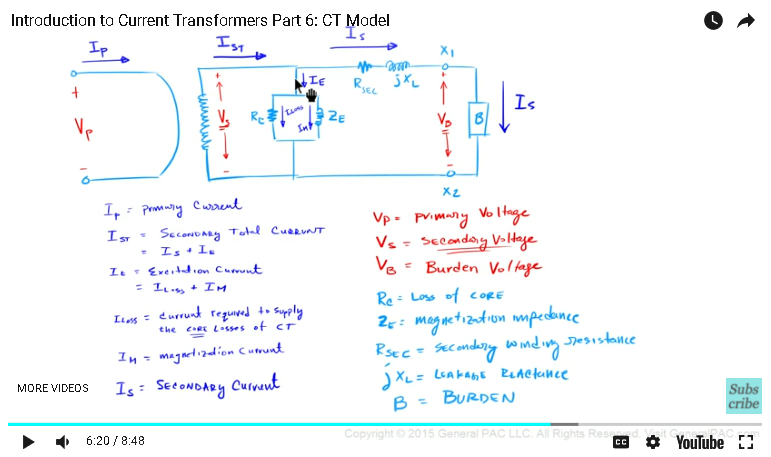 The burden of the current transformer. So, let's resize this a little bit to make it fit. Okay, so, we've explained all of the values that are associated with modeling a current transformer, right? We looked at the primary current, the primary voltage, the secondary voltage, which is actually measured across this magnetization branch. The total secondary current, which is the current that's equal to this exciting current. Plus the secondary current that's actually going through the burden. 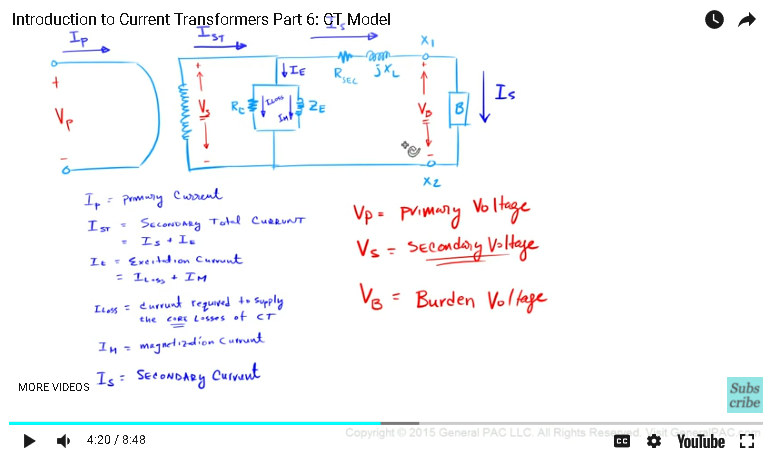 We looked at this RC value which represents the core losses of the actual transformer. The ZE value which is the magnetization impedance. R secondary value which is the secondary winding resistance. The JXL which is the leakage reactance and the burden. And we looked at all of these currents, okay? So, I kept on saying that the ZE value is really non linear. Which means it's going to change based off of the secondary flux. And remember that the secondary flux is really controlling this secondary voltage. So, we're actually saying is that this ZE value is directly proportional to this secondary voltage value. And during normal operating conditions we should expect this magnetization branch to be really high. So, this magnetization branch should be, you know, a thousand [OM's 00:07:19] or 10,000 OM's so during normal operating conditions, and steady state conditions, this magnetization impedance should be really, really high. So this exciting current should be very, very low. The total secondary current should closely equal the secondary current. 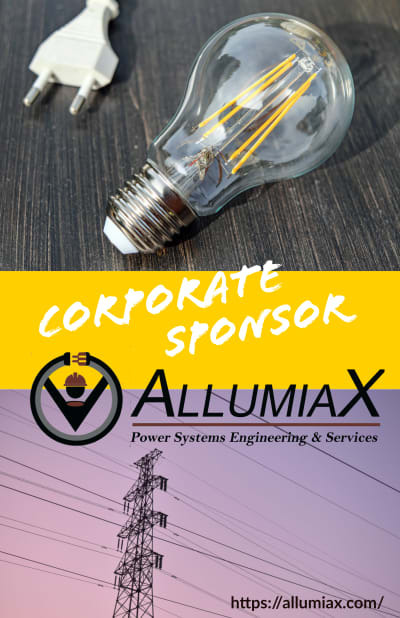 And remember for a current transformer the whole purpose of it, the secondary current is directly proportional to the primary current based off of the current transformer ratio. So, can you imagine what this excitation current really implies. Well, this simply implies the errors of that current transformers. And those errors are often called this saturation, right? So we hear that a lot. That current transformer is going to saturate. What's the limit of the saturation point? So this point, this saturation, or this errors of occurring transformers that's modeled by this excitation current that's flowing through this magnetization branch and that's a non linear value. So in part seven we're going to talk about saturation but from a CT models perspective. We're going to correlate saturation with this excitation current as well as this secondary voltage. And we're going to see how the burden plays a role in all of that. This module was brought to you by GeneralPac.com. Making protection, automation and controls intuitive.